BEIRUT — Kurdish forces trying to fend off a deadly Turkish offensive in northern Syria are in the awkward position of demanding help from the very regime they want more autonomy from. The self-proclaimed Kurdish administration there has urged the forces of President Bashar Al Assad to protect their enclave of Afrin, which Turkish forces assisted by Syrian rebels attacked on January 20. But the minority, which achieved increased autonomy on the back of Syria’s seven-year-old conflict, rejects Damascus’ condition of a return of federal security forces and institutions in their region. Such moves would bring an end to Kurdish control over Afrin, one of the three regions in “Rojava”, the administration unilaterally proclaimed over the Kurds’ Syrian heartland, which runs along the Turkish border. “The Kurds always wanted good relations” with the regime, said Kurdish affairs specialist Mutlu Civiroglu, stressing that the minority never pursued fully-fledged independence. “But they don’t want to go back to the situation before the war, when they didn’t really exist, they didn’t have any rights,” the analyst said of the Kurds, who account for around 15 per cent of Syria’s population. Long oppressed by Damascus, the Kurds took advantage of the escalation of a conflict that began in 2011 with nationwide opposition protests to secure de facto autonomy over Syria’s northern regions. They brought the long-banned Kurdish language back to schools, set up their own security apparatus, which includes a militia called the People’s Protection Units (YPG) that acts as an army. The force, which has close ties to Turkey’s own Kurdish rebellion, emerged as a major player in the war against the Daesh terror group and a partner of choice for the US-led coalition. 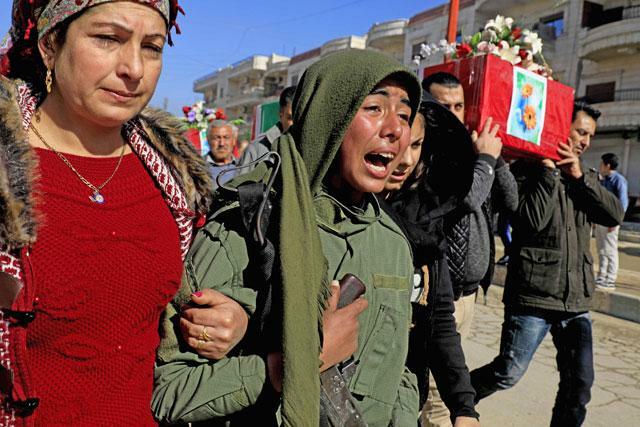 The Turkish assault on Afrin has exposed the ambivalence of the relationship between the Kurds and Assad, who does not see the minority as a direct threat but resents their emancipation. Turkey considers the YPG to be a terrorist group and fears the empowerment of Syria’s Kurds could be contagious. At least 55 civilians and 78 fighters have been killed in 10 days of Turkish strikes and shelling on Afrin, according to the Syrian Observatory for Human Rights, but the Kurds still reject the idea of handing the region back. What they have asked for during a Russian-sponsored meeting is the deployment of federal Syrian forces along the border with Turkey. The Kurdish proposal provides for “the return of Syrian border guards and the raising of the Syrian flag at the border to reassure the Turks” ,said Ahed Al Hendi, a senior adviser to the Kurdish administration. “The Kurdish defence, police and security forces would be maintained,” stressed Hendi, a member of the Syrian Democratic Forces, of which the YPG is the backbone. “Surrendering Afrin to the Syrian regime, that’s impossible,” he said, adding however that the regime has yet to give a formal reply. On Thursday, the self-governed region of Afrin had urged Damascus to enforce sovereignty over its borders and prevent Turkish jets from violating Syrian airspace. So far Damascus has only condemned the Afrin assault as a “brutal Turkish aggression”. Bassam Abou Abdallah, who heads the Damascus Centre for Strategic Studies, argued the Kurds couldn’t have their cake and eat it. “The Kurds should take responsibility for what they have done… the Syrian state is not at their service and can not just be called when you need it,” he said. Before the offensive on Afrin, Russian forces that had been stationed in the area and trained YPG units withdrew, sparking accusations that Moscow had sanctioned Ankara’s operation. Kurdish officials told AFP that Moscow had offered them protection against Turkey if they relinquished their territory to the regime and that Russia pulled its air support when they refused. Some analysts also argued that Damascus was allowing Turkey to conduct military operations on its soil because a few more days of Kurdish losses would serve its interests. “Maybe they want Kurdish forces further weakened,” the analyst Civiroglu said.